Coach Tony Arntson and his Helena High Bengals will open the season at 4:30 p.m. Friday at CMR. Capital's Matt McGinley is new to the quarterback position this season, but the Bruins' coaching staff has all the pieces around him to set the senior up for a strong season. 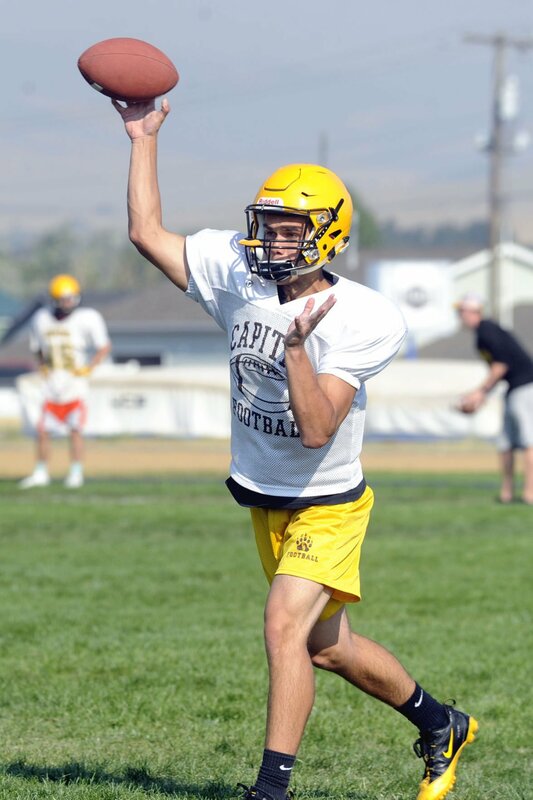 Summer practices, camps, two-a-days, scrimmages … they’ve all been in preparation for Week 1, and both Helena High and Capital are eager for kickoff. For Helena High, it will come a little earlier than originally scheduled. The team will play an afternoon game in Great Falls, where the new artificial turf at Memorial Stadium is not yet ready. That necessitated a location change, and the teams will play CMR at Jack Johnson Pride Field -- the Rustlers’ practice field. “Obviously, it wouldn’t be what you’d choose to do. But it’s what it is,” Helena coach Tony Arntson said of the game’s location. “Like I told the kids, the one thing about it is it’s gonna be unique for them. It’s gonna be a unique experience. I spent my first three head coaching years at Charlo, Class C football. And honestly, that atmosphere, with people down around the track -- and they just rope the field off and you’ve got parents hanging over the rope and yelling and screaming -- it actually does create a really neat high school atmosphere. Getting ready, though, is also a bit of a challenge. There is no lighting at Pride Field, which is why the contest was moved ahead three hours. Teams will occasionally play an afternoon game during the season or in the playoffs, but it presents challenges, Arntson said. Leading the way again will be senior quarterback Kaleb Winterburn. But there will also be multiple new faces on the offense, particularly at the skill positions. There, players like Kyle Tabbert, Ray Trudeau and Zach Huth will take over for graduated seniors. The Bengals’ defense is peppered with returners, but also is heavy with younger players. That will mean some hiccups early on, but Arntson is excited for what the unit can do once it finds a solid footing. The next in line at CMR is Garrison Rothwell, who will be starting at quarterback this season. The converted tailback has a veteran receiver corps, including the top target a year ago, Kyle Byrne. One player to watch out for as well is senior speedster Damien Nelson. The two-time defending 100-meter champ routinely runs sub-11 seconds in the event, and that speed has translated to the football field. Capital, meanwhile, will be at home to open 2017. The Bruins only played once at Vigilante in the first half of the season a year ago, and are ready to welcome Great Falls High to the Capital City for a 7 p.m. kickoff. After having a week to dissect and digest last Friday’s scrimmage, Bruin coach Kyle Mihelish said there were things to fix. But, overall, he’s pleased. Capital is starting Matt McGinley at quarterback this season, moving the athletic senior over from cornerback. A 3-point threat in the gym and a sprinter on the track, McGinley fits well in the Bruins’ read-option-type offensive scheme. He’s still working to improve his passing game, but his intelligence and feet will give him every chance to be successful, Mihelish said. Helping the new QB will be Seth Schneider’s return. A two-way All-State player a year ago, Schneider not only led the defense, but piled up nearly 1,000 yards as a fullback. He, along with change-of-pace back Brennan Casey and an experienced offensive line -- along with an equally impressive defensive line -- are what have many in the state eyeing Capital as an early Class AA favorite. The Bruins’ defense will be facing a veteran quarterback in Great Falls’ Kevin Boes. He threw for nearly 2,000 yards in 2016, completing 62 percent of his passes. And while the Bison finished 2-8 a year ago, coach Mark Samson had his team in nearly every game. In many of the losses, the Bison held fourth-quarter leads before being edged out. “We faced them this summer at a Carroll camp here, and the quarterback looks good,” Mihelish said. “They’ve got good skilled kids on the perimeter, their receivers look good -- they’re quick. Follow IR sports editor Troy Shockley on Twitter @IR_TroyShockley or contact him at troy.shockley@helenair.com. We previewed the 2017 high school football season.